Do I live in St Matthew’s Parish? Please refer to the map to the left. This should help you decide whether or not you are resident within the ecclesiastical parish. Knowing which parish you live in is of particular importance when you are wanting to get married in church or seeking baptism. Please refer to our guidelines to the law. There may be particular uncertainty where the parish boundary crosses a road, as is the case at the north end of Park Avenue North, the Kettering Road, and Hazeldene Road. In these cases we will be able to help you. The ecclesiastical parish is a relatively small, densely-populated area of approximately one mile square, situated one-and-a-half miles from Northampton town centre. The parish is predominantly residential consisting of Victorian terraces, between the Wars semi-detached dwellings, and a pocket of substantial Edwardian houses in the vicinity of the church. The housing is broadly indicative of the social diversity to be found in the area. Approximately 7000 people live in the parish. The age demographic of residents is gradually shifting downward as terraced housing in particular comes onto the market. There are several marked sub-communities, and the Kettering Road is an important psychological divide within the locality. Several ethnic minorities are represented, in particular those of African, Caribbean and Eastern European origin. These are well represented in our congregations. 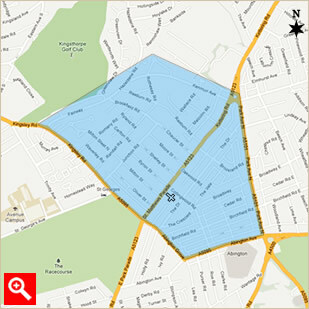 The parish boundaries are ‘porous’ in that worshippers within the township routinely travel to a church of choice. The majority of worshippers at St Matthew's live within the town. Apart from shops and essential services most people travel out of the parish to work. Many work in education, the service industries and commerce, though a full range is represented. There is one primary school within the parish and several just over our borders who look to us in specific ways. A campus of the University of Northampton, Malcolm Arnold Academy, and the County Cricket Ground are nearby. We minister to a significant number of residential and nursing homes in the parish. There are two large parks nearby which attract many family-based activities.